Malita goes door to door educating her neighbors and others on healthy behaviors and the importance of visiting a health facility when they get sick. Her name is Martha, but the villagers nicknamed her Malita, and when they call this community health worker by name, they always say A Malita (pronounced “ahh”)—a term of respect in this region of Malawi. The mother of four lives in the village of Kapinga, in Malawi’s Lilongwe District, named after the country’s capital city. Like many in her village, Malita grows her own crops—maize and groundnuts to eat, tobacco for money. Unlike her peers, Malita goes door to door educating her neighbors and others on healthy behaviors and the importance of visiting a health facility when they get sick. Malita has been at this work for nearly half of her 40-some years. She started as an HIV/AIDS volunteer counselor and, today, works as a health volunteer through Kabudula Rural Hospital and the Jhpiego-supported Support for Service Delivery Integration Project. Among a wide range of duties, Malita monitors the growth of children in surrounding villages to ensure they are being properly nourished. 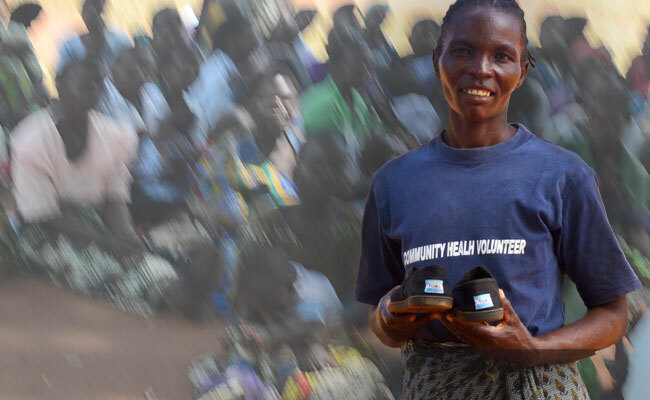 Thanks to an innovative and impactful partnership between TOMS and Jhpiego, Malita is one of thousands of community health workers across Malawi to have received a sturdy new pair of TOMS Shoes as part of a pilot project to encourage and retain community health workers. For Malita, who often travels on foot more than 5 kilometers to provide care, the gift of shoes empowers her to reach more children with lifesaving health services. A pair of TOMS Shoes helps Malita avoid the cuts, scrapes and infections that would otherwise hinder her work. “I need to be in good health in order to be able to continue volunteering and these shoes have made that possible for me,” she says. More than 8,000 community health volunteers so far have received TOMS Shoes through the Jhpiego partnership. They are sharing health information and connecting families to health services in districts where an estimated 544,000 children under age 5 live. Malita knows better. “Ignorance can lead to death,” she says. Through a continuing partnership with TOMS, Jhpiego will help ensure that children receive screening and treatment for malaria, HIV-positive mothers get the medicine they need to prevent passing the virus to their newborns, and vulnerable families access lifesaving health care for their children. Each week on Tuesday, Malita walks more than 5 kilometers to Kabudula Rural Hospital. 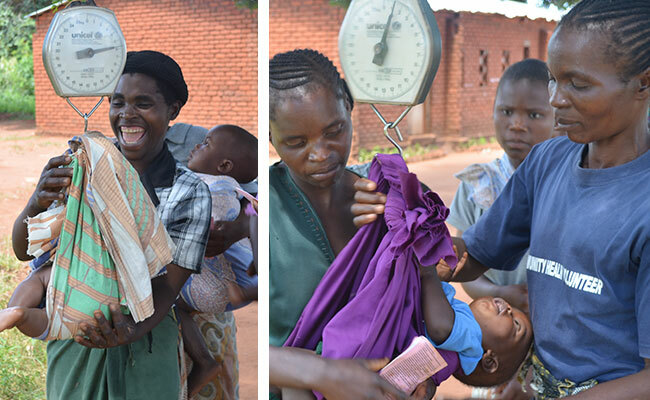 There, at the clinic for children under 5, Malita weighs the children before a nurse or doctor assesses them. Once a month, she travels to the Kapinga Primary School, where she weighs children and gives health talks on a variety of subjects. She helps distribute water disinfectants, insecticide-treated bed nets to prevent malaria and other items as part of this outreach clinic. As part of her work, she looks for key hallmarks of malnutrition and checks children in her village against normal growth curves to ensure that they are developing as they should. When children appear malnourished, Malita promptly refers them to Kabudula Rural Hospital’s Nutrition Rehabilitation Unit. Malita’s impact on such a large population is one of the key reasons for the TOMS Shoes pilot initiative with Jhpiego: community health workers reach hundreds, sometimes thousands, of children and families and link them with life-sustaining health services. Malita routinely interacts with over 100 families in her village. Malita’s work doesn’t end with the hundreds of children in her village. Alongside other volunteers, Malita participates in weekly cooking lessons that teach mothers of malnourished children how to locally source and prepare nutritious meals for their kids. The lessons educate new mothers on a range of topics such as the importance of protein in a well-balanced diet. Malita teaches mothers about the basic food groups, and how to cook healthier, nutritious versions of common Malawian dishes like nsima and ugali—corn flour-based porridges often cooked without meat in poor, rural villages like Malita’s. Mothers have remarked gratefully that the lessons aren’t just about nutrition—the children enjoy the new meals as well! For over 40 years, Jhpiego has been committed to preventing the needless deaths of women and their families. Jhpiego’s partnership with TOMS in this unique and innovative pilot project has helped keep community health workers like Malita engaged and committed to returning each day to help save children’s lives. 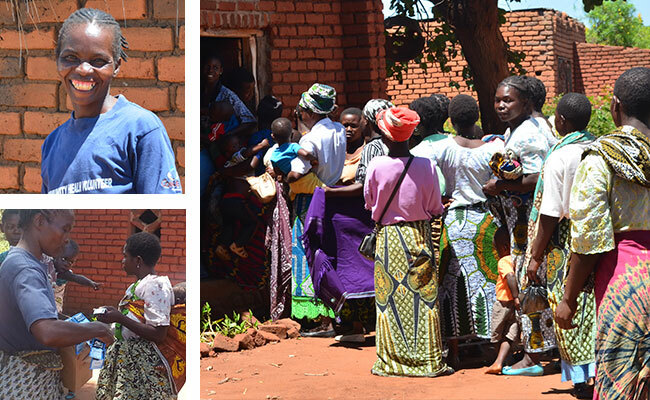 “It has really created enthusiasm in the volunteer work,” says Dan Wendo, Jhpiego’s Chief of Party for the Support for Service Delivery Integration Project in Malawi. Community health workers are a vital component of health care provision in the developing world, often reaching some of the most vulnerable, hard-to-reach communities with important services. The new TOMS Shoes pilot project in Malawi is an important step in continuing to innovate, supporting the heroic efforts of health workers like Malita and impacting more lives in the communities that need them the most.